This is a real renaissance piece. The Amazon Princess seeks to discover the secret of her true origin, who deceived her, and why. With the news that Mattel is losing the DC license, Mattel might as well change the name of their DC toyline from "Multiverse" to "Too Little, Too Late." It would certainly sum things up. Year after year, they've spectacularly failed to get their toys into stores, getting worse all the time (if you're wondering why we haven't reviewed any of the Clayface BAF series, well, it kind of requires being able to purchase them first). Now we're racing toward the finish, and finally - finally! - Mattel stops reusing molds that were outdated when they were introduced. Honestly, the company will never pass up an opportunity to prove we're not just joking when we say there's no idea they can't do wrong. 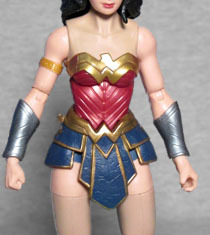 Mattel already made a "New 52" Wonder Woman, but that's not what this is supposed to be; this look, with its strong movie costume influences, came about during the Rebirth reboot. It was designed by Tony Daniel, and refined by Jim Lee. She has an armored bodice, a blue leather skirt with gold edges and a gold star on each hip, silver forearm guards with recessed detailing, and red knee-high boots with gold knee guards and accents. 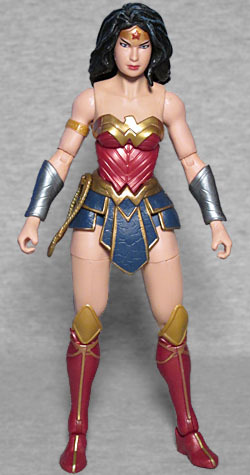 Technically she should also have a red cape with a gold edge, but that didn't make it onto the toy. Every bit of her is a new sculpt, and it's not like Mattel is going to have time to reuse these molds before the end of the year. The face is not great. It would have been better served by being based specifically on the art of either Jim Lee or Tony Daniel... or, if it's supposed to be, then the sculpt needed to be a lot better. The face is round and featureless - I mean, it's got eyes and a nose and a mouth, as most faces should, but it lacks personality. It doesn't immediately exclaim "Diana of Themyscria" when you look at it; more "Joyce, your mother's coworker." The truly shocking thing about this figure is its articulation. We're used to Mattel's comic toys lagging behind the times (to give you an idea: even McFarlane is doing better than them these days), but this... well, let's be honest, it's still stuck in the past, but not as far in the past. She has double-hinged knees, for cryin' out loud! Just like a real action figure would! The elbows are a bit "first years of Hasbro's Marvel Legends," with their swivel/hinge construction, so that's not so great, and the range on the chest balljoint could be better, but this is far, far better than Mattel has seen fit to give us in the 16 bloody years they've been squatting uncomfortably on the DC license. Beyond the joints mentioned so far, there's a balljointed head, swivel/hinge shoulders and wrists, balljointed hips, swivel thighs, and swivel/hinge ankles. We must point out a problem with the colors, though: the skintone on the chest and thighs is a clearly different color than the skintone on the arms, face and hips; like, one is pink and healthy, and the other is a cadaverous blue. It completely ruins the look of the toy, as it's completely visible even under normal light - not just one of those things that shows up on camera/under fluorescents or something. Mattel should have sprung for paint. On the other hand, if they had painted the skin one proper color, we might not have gotten so many accessories. 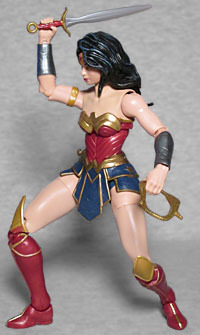 Diana has an extra right hand, closed into a fist instead of open to hold the included sword. 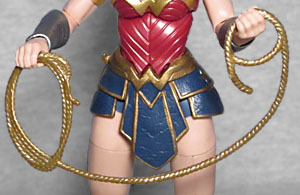 Like many a Wonder Woman, she includes a coiled up lasso of truth you can hang from the hook on her hip; but unlike most Wonder Womans, she also includes a second lasso, partially uncoiled like she's in the midst of using it. The lassos would look better if they were a bit more yellow (in toys, gold ends up tinted toward blue if you're not careful), but having two versions is better than most toys manage. In addition to all that, she includes two pieces of this series' Lex Luther Build-A-Figure: the legs. That's right, she's got legs, and she (presumably) knows how to use them. Mattel hasn't broken their trend of "no actual stores will carry our product" with this series, because no actual stores seem to be carrying this product. This whole series surprisingly showed up on Amazon for normal retail price, but that's not remotely the same as appearing at Walmart or Target, now is it? 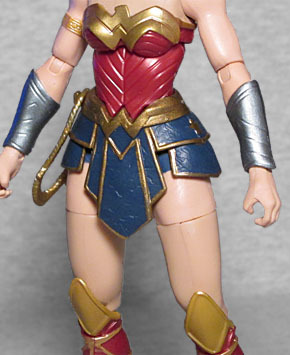 Rebirth Wonder Woman may be a bit naff by general comicbook toy standards (*cough cough Marvel Legends cough*), but if you only compare her to Mattel's own output, she's one of the better things they've ever done. Too little too late, though.